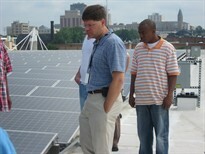 The Green Collar Jobs program helps prepare urban fathers for emerging jobs in the new green economy. This program is a six-week commitment for dads in the community to attend classes from 9 am to noon three days a week. The course is designed to teach dads about employment opportunities in the fields of renewable energy and energy efficiency. This program has been a great success thanks to the help of leaders in our community like Kurt Conard, director of planning for the Akron Metro Transit, and David Whited, chief of planning and development for Summit County Metro Parks. They give tours of buildings that meet Leadership in Energy and Environmental Design (LEED) certification and have solar, wind and geothermal energy systems. Whited felt this program was a great opportunity for the dads and wanted to promote the idea of green buildings and sustainable living. He said, "I was inspired by my experience with a room full of energetic young men who were motivated to become a part of the green movement." "The Green Collar Jobs program was a pleasurable experience for me," said Cameron Butler, one of the dads who successfully completed the program. "Mr. Walker's math class was the most challenging, but also the most rewarding component of the program." For more information, contact Donald Lykes at 330-548-2319 or fsoneo@gmail.com.